Not to be confused with Octo Valley missions or Salmon Run Stages. 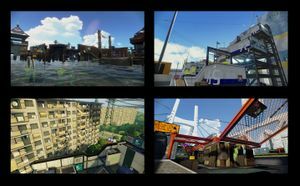 Stages are arenas that are playable in Splatoon's modes. 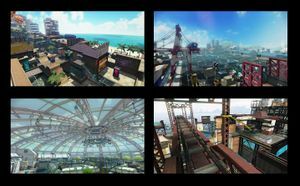 Splatoon 2 has all-new stages with some returning stages as well. By analyzing the percentages given out by Judd at the end of a match, it is possible to know what a level's inkable surface area is. For instance, at the end of a match, if one team gets 400 Battle Points and the other gets 600 (for a total of 1000 points of turf inked), and the percentages for each are 33.3% and 50%, respectively, that means the stage's total possible turf area is 1200 points (400 * (1 / 0.333) = 600 * (1 / 0.5) = 1200). However, since the display is rounded down, the result may sometimes be ambiguous and multiple results need to be intersected to reach the exact number. For example, for 600p and 50%, any total in the range 1198-1200p would result in 50.0% when rounding down to 0.1% - but if another result was collected showing that 751p is 62.5% (possible totals: 1200-1201p), the only possible value that satisfies both is exactly 1200p. Calculating using the total (in the example above, (400 + 600) * (1 / (0.333 + 0.5)) ) should be avoided, as it doubles the margin of error and could give even less accurate results. 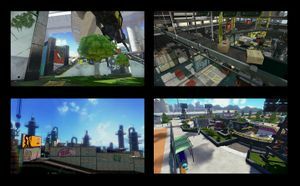 Many stages are often abbreviated by players using one or the other of the two words in the name, such as Saltspray, Walleye or Mall. 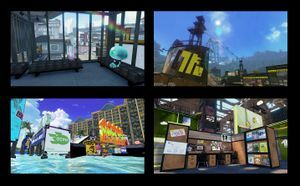 Manta Maria is the only stage where the promo picture is taken in the background, and not the stage itself. This page was last edited on 11 April 2019, at 18:32. This page has been accessed 243,745 times.